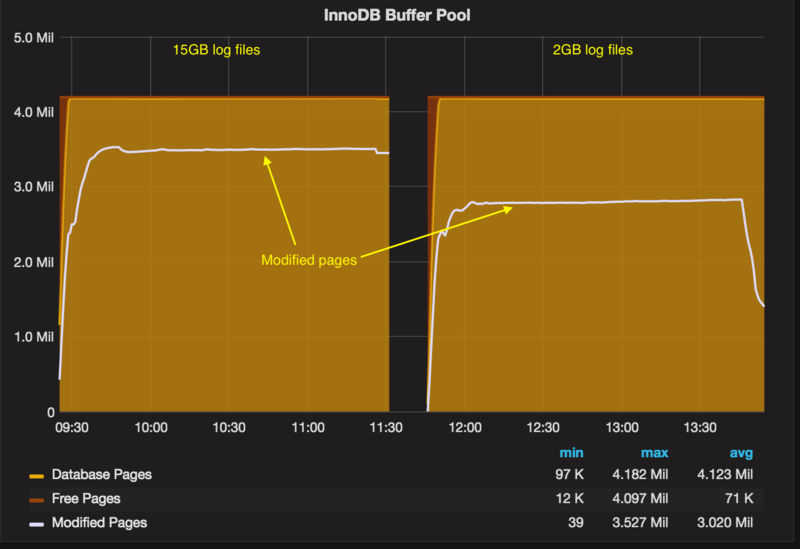 What is a big innodb_log_file_size? , and how it can affect performance. with an indication that it might be too big?
. Is that too big? Let’s take a more detailed look at this. First, let me start by rephrasing my warning: the log file size should be set as big as possible, but not bigger than necessary. A bigger log file size is better for performance, but it has a drawback (a significant one) that you need to worry about: the recovery time after a crash. You need to balance recovery time in the rare event of a crash recovery versus maximizing throughput during peak operations. This limitation can translate to a 20x longer crash recovery process! But how big is “big enough”? Is it 48MB (the default value), 1-2GB (which I often see in production), or 10-15GB (like we use for benchmarks)? How close checkpoint age is to the async point (again, see previous material https://www.percona.com/blog/2011/04/04/innodb-flushing-theory-and-solutions/). This is adaptive flushing. to the percentage of actual dirty pages. You can see this in the LRU flushing metrics.
. This is also in LRU flushing metrics. defines the async point, and how big checkpoint age can be. To show a practical application of these forces, I’ve provided some chart data. 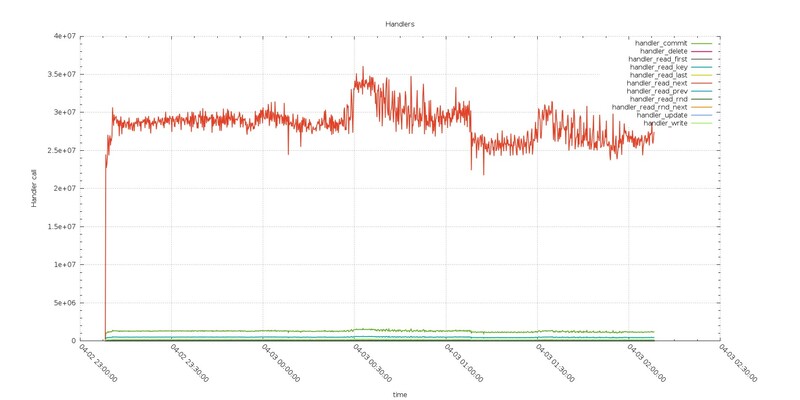 I will use charts from the Percona Monitoring and Management tool and data from Percona Server 5.7.
will have 4GB of log space, from which MySQL will use about 3.24GB (MySQL makes extra reservations to avoid a situation when we fully run out of log space). (I do not see technical barriers for this). We can see that there are more modified pages in the case with 15GB log files (which is good, as more modified pages means less work done in the background). And the most interesting question: how does it affect throughput? , the throughput is about 20% worse. 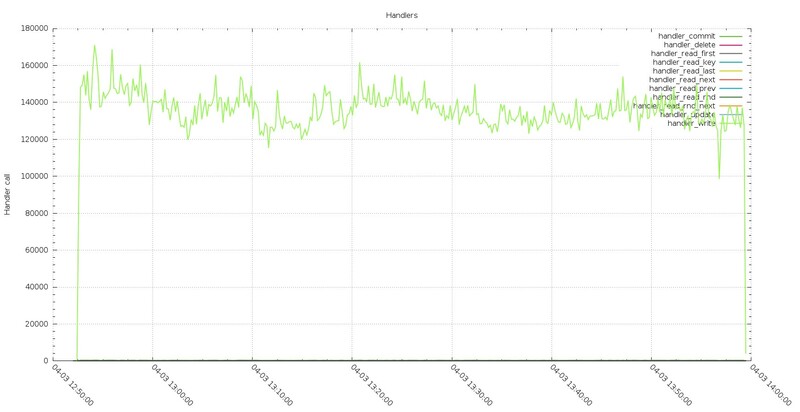 With a 2GB log size, you can see that often zero transactions are processed within one second – this is bad, and says that the flushing algorithm still needs improvements in cases when the checkpoint age is close to or at the async point. What about the recovery time? 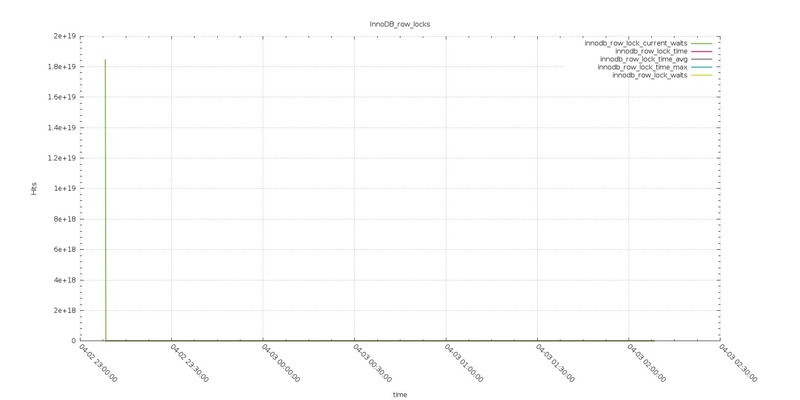 To measure this, I killed mysqld when the checkpoint age (uncheckpointed bytes) was about 10GB. It appeared to take 20 mins to start mysqld after the crash. In another experiment with 25GB of uncheckpointed bytes, it took 45 mins. Unfortunately, crash recovery in MySQL is still singlethreaded, so it takes a long time to read and apply 10GB worth of changes (even from the fast storage). The system uses 2% of the CPU (which corresponds to a single CPU). In many cases, crash recovery is not a huge concern. People don’t always have to wait for MySQL recovery – since even one minute of downtime can be too long, often the instance fails over to a slave (especially with async replication), or the crashed node just leaves the cluster (if you use Percona XtraDB Cluster). , and I think it is possible to add parallelism similar to multithreaded slaves into the crash recovery process. You can find the raw results, scripts and configs here. One of the first-world problems most plaguing the new corporate world is the time wasted trying to find and secure a meeting room. At least, that’s the premise Robin is based on. Robin is a company that helps offices organize, track, and monitor their spaces. In this blog, we’ll discuss the ramifications of the Galera Error Failed to Report Last Committed (Interrupted System Call). Reporting the last committed transaction is just a part of the certification index purge process. In case it fails for some reason (it occasionally does), the cert index purge may be a little delayed. But it does not mean the transaction was not applied successfully. This is a warning after all. As there isn’t much documentation regarding this error, and internet searches did not bring up useful information, my colleague David Bennett and I delved into the source code (as we do on occasion). This means that the thread was interrupted, but the server will retry on another thread. As it is just a warning, it isn’t anything to be too concerned about – unless they begin to pile up (which could be a sign of concurrency issues). 60 log_warn << "Failed to report last committed "
This warning could be handled better so as to not bloody the logs, or sound cryptic enough to concern administrators. 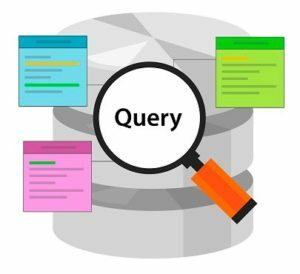 TL;DR version: By using the MySQL X Plugin with NodeJS I was able to increase query performance 10x (some query rewrite required). If you can make it to Manhattan Thursday, June 30, 2016, please join me at the Community Open House for MongoDB. The Community Open House for MongoDB, held from 9 AM to 6 PM at the Park Central Hotel, is a free and open event that will feature technical presentations and sessions from key members of the MongoDB open source community. It’s the day after MongoDB World ends, so many of you will already be in town and ready to talk MongoDB – stay one more day to get an even bigger and broader perspective on your MongoDB needs! The open source community is a diverse and powerful collection of companies, organizations and individuals that have helped to literally change the world. Percona is proud to call itself a member of the open source community, and we strongly feel that upholding the principles of the community is a key to our success. These principals include an open dialog, an open mind, and a zeal for cooperative interaction. 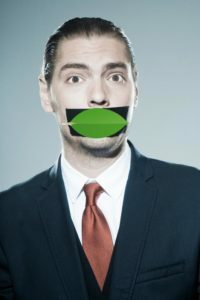 Since Percona and ObjectRocket weren’t allowed to participate in MongoDB World, we felt this event would help foster creative and productive dialogue within the community. Together, we can build amazing things! A reception will be held from 4:30 PM to 6:00 PM, featuring plenty of food, drink and fun. The Community Open House for MongoDB features expert speakers from Percona, ObjectRocket, Facebook, Appboy, Severalnines and The Washington Post. Here’s a partial lineup – more will be announced soon! This event is free of charge and open to all, but we do ask you to register in advance so we can save you a seat. I hope to see you Thursday in NYC! Are you using Grafana 3.x with Prometheus’ time-series database? Now there is a “Percona App” available on Grafana.net! 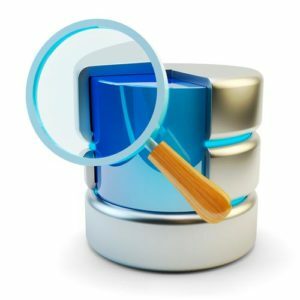 The app provides a set of dashboards for MySQL performance and system monitoring with Prometheus’ datasource, and make it easy for users install them. The dashboards rely on the alias label in the Prometheus config and depend on the small patch applied on Grafana. The Grafana and Prometheus teams are doing a fantastic job of bringing monitoring and time-series to the next level. They are making collecting and graphing metrics simple and more usable. See my previous blog post for step-by-step instructions on how to install Grafana and Prometheus. Get the Percona App for Grafana today! Some time ago, I published the article on AWS Aurora Benchmarking (AWS Aurora Benchmarking – Blast or Splash? ), in which I analyzed the behavior of different solutions using synchronous replication in AWS environment. This blog follows up with some of the comments and suggestions I received regarding that post from the community and Amazon engineers. I decided to perform another round of tests, keeping in mind comments and suggestions received. I presented some of the results during the Percona conference in Santa Clara last April 2016. The following is the transposition that presentation, with more details. A very good question, with an easy answer. Aurora is a product that is still under development and refinement: six months of development could present major changes in performance. Not only that, but the initial tests focused on entry-level solutions, meaning I was analyzing the kind of users that are currently starting their business and looking for a flexible solution that allows them to save money and scale. This time, I put the focus on enterprise solutions by analyzing what an already well-established company would get when looking for a decent scalable solution. These are two different scenarios. Why so many (different) tests? I used many different benchmarking tools, and I am still planning to run others. Why so? Why not simply use one of them? Again, a simple answer. I used different tools because in some cases, they provide me a different way of accessing and using data. I also do not trust benchmarking tools, not even the ones I developed. I wanted to test the same thing using different tools and compare the results. ONLY if I see a common pattern, then would I consider the test valid. Personally, I tend to discard any test that is not consistent, or if the analysis performed is using a single benchmarking tool. In my opinion, being lazy is not an option when doing these kind of exercises. It was difficult to compare apples to apples here. And I think that is the main point to keep in mind. Aurora is not a standard RDS solution, like we are used to. 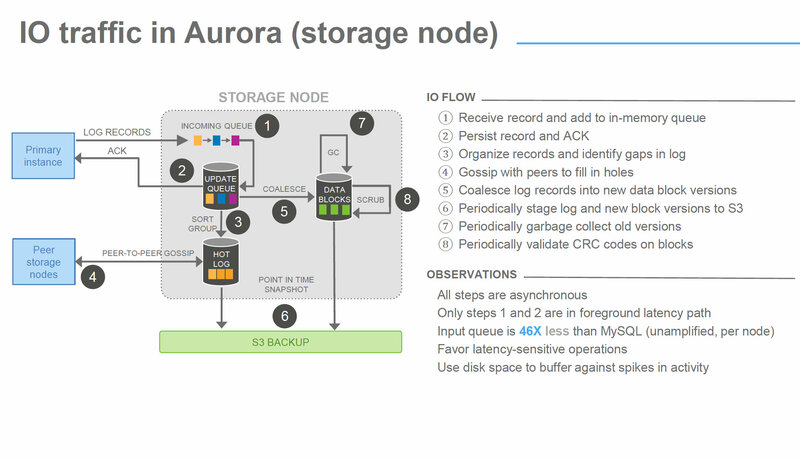 Aurora looks like MySQL, smells like MySQL, but is not vanilla MySQL. To achieve what they have, the engineers had to change many parts. The more you dig in, the more you realize there are significant differences. Because of that, I had to focus more on identifying what each solution can do and compare the solutions against expectations, rather than comparing the numbers. I have a burst of connections, and my application goes from 4K to 40K connections. Will it crash? Will it slow down? How long should I wait if a node fails? What should I not have in my schema design, to prevent bottlenecks? Those are relevant questions in my opinion, more so than discovering that solution A has 3000 rows written/sec, and solution B has 3100. Or that I might (might) have some additional page rotation, file -> memory-> flushes because the amount of memory differs. That is valuable information, for sure, but less valuable than having a decent understanding of which platform will help my business grow and remain stable. What is the right tool for the job? This is the question I am addressing. These tests were the most extensive and demanding. I analyzed the capacity to serve the load under different conditions, from a light load up to full utilization, and some degree of resource saturation. 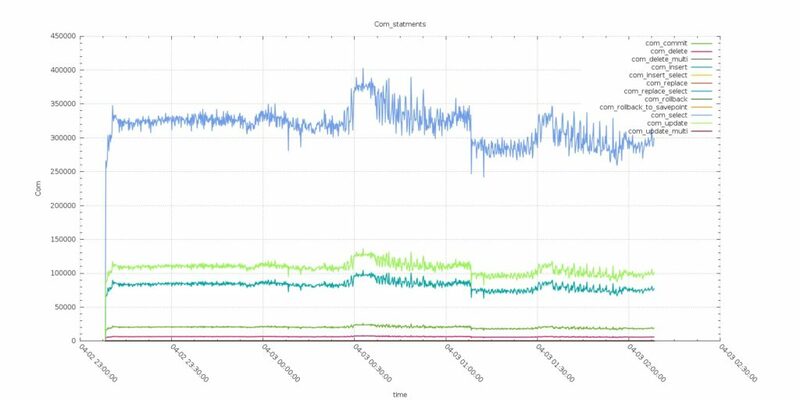 The first set of tests were to evaluate a simple load on a single table, causing the table to become a hotspot and showing how the platform would manage the increasing contention. The second set of tests were to perform a similar load, but distributing it cross multiple tables and batching the operations. Parallelization, contention, scalability and distributed hotspots were in the picture. The two above focused on write operations only, and were done using different tools (comparing the results as they were complementary). Third set of tests, using my own stress tool, were focused on R/W oriented usage. The tests were executed against multiple tables, performing CRUD actions, using simple and batch insert, reads by PK, index, by range, IN and exact match conditions. The fourth set of tests were performed using a TPC-C like load (OLTP). The fifth set of tests were using sysbench in OLTP mode, with 250 tables. Finally, all tests were run with fully utilized BufferPool. It was pointed out to me that I deliberately chose to use an Ec2 solution for Percona XtraDB Cluster with less memory than the one available in Aurora. This is true, and we must take that into consideration. The reason for this is that the only Ec2 solution matching the memory of a db_r3.8xlarge is the d2.8xlarge. I did try it, but the level of scalability I got (from the CPU point of view) was less efficient than the one available with c3.8xlarge. I decided to prefer CPU resources to memory, especially because I was going to test concurrency and parallelism in conjunction with the load increase. From the result, I feel confident that I chose correctly – but I am open to comment. Where you read Java, those are the application nodes running the different test applications. Aurora has a few key concepts that we must have clearly in mind, especially how it manages the writes across replica, and how connections are implemented. 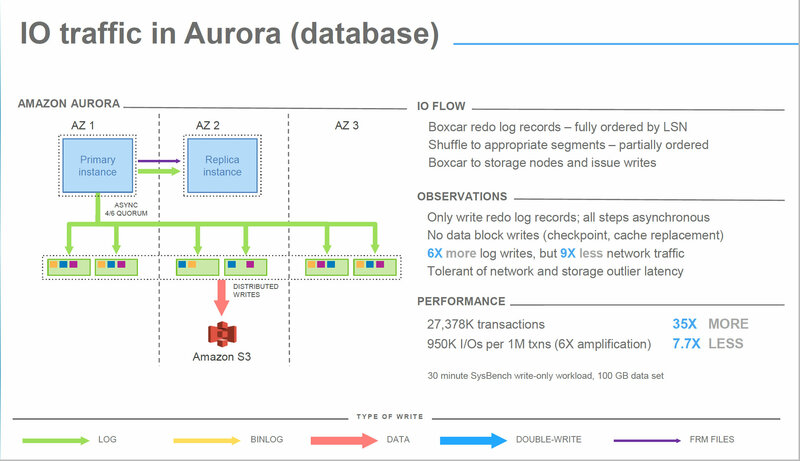 To replicate the information across the different storage, Aurora only replicates FRM files and data coming from IB_LOGS. This is a quite significant advantage to other forms of replication, given the limited number of bytes that are replicated over the network (and also if they are replicated six times). 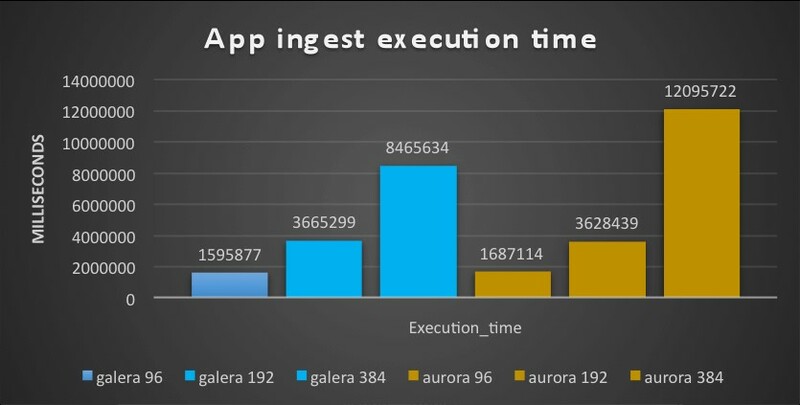 Another significant advantage is that Aurora does not use a double write buffer, which is obviously another blast (see the recent optimization in Percona Server https://www.percona.com/blog/2016/05/09/percona-server-5-7-parallel-doublewrite/ ). 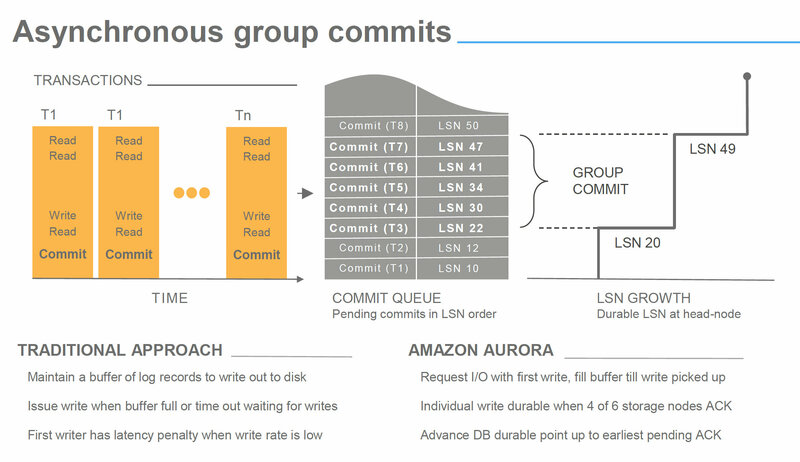 In other words, writes in Aurora are organized by filling its commit queue and pushing the changes as group commit to the storage. In some presentations, you might have seen that all steps are asynchronous. But is important to underline that a commit is acknowledged by Aurora when at least two availability zones (AZ) have received and written the incoming data related to that commit. Writes here mean received in the storage node incoming queue and with a quorum of four over six nodes. This means that no matter what, data has to travel on the network to reach the final destination, and ACK signals come back before Aurora returns the ACK to the commit operation. The network is in the same region, but still it could represent an incognita about performance. No wonder we could have some latency at this stage! As you can see, what I am reporting is also confirmed in the image below (and in the observations). The point is that the impact of steps 1 – 2 is not obviously clear. 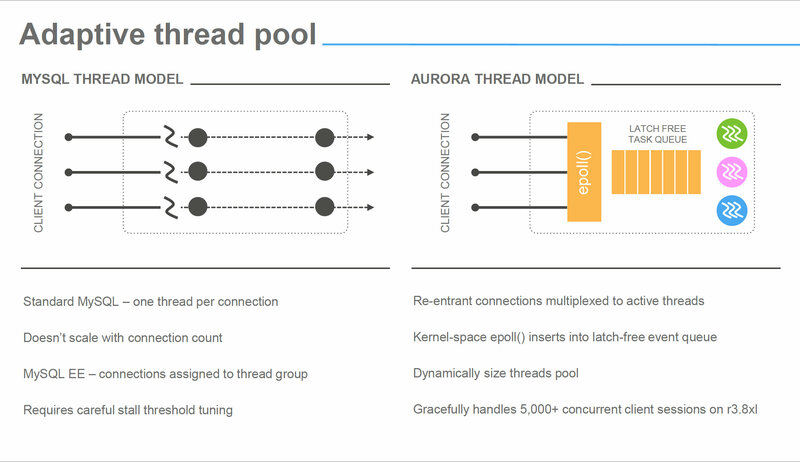 Aurora also use thread pooling – a lot! That will become very clear later, and as more of the work is based on parallelism, the more efficient thread pooling seems to be. In most cases we are used to seeing CPUs on database servers not fully utilized, unless there is some heavy ordering operation or a bad query. That behavior is also (not only) a direct consequence of the connection-to-thread model, which implies a period of latency and stand by. In Aurora, the incoming connections are not following the same model. Instead, the pool redistributes the load of the incoming connection to a pool of threads, optimizing the latency period, resulting in a higher CPU utilization. Which is what you want from your resource: to be utilized and not waiting for something else to do its job. Without wasting more electronic ink, let see what comes out of this round of tests (not the final one by the way). To simplify the results, I will also report the graphs from the first set of tests, but will focus on the latest.Small Boxes = SB, Large Boxes LB. Small Boxes = SB, Large Boxes = LB. As declared previously, my scope was to verify how the two platforms would have reacted to a simple load focus on inserts with a basic single table. 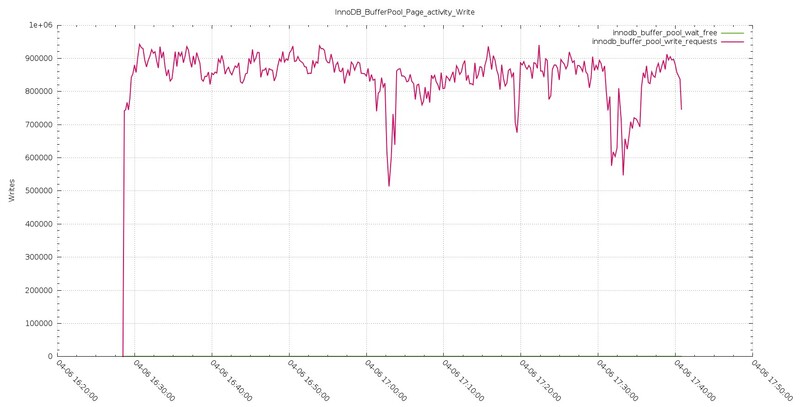 The bufferpool was saturated before running the test. 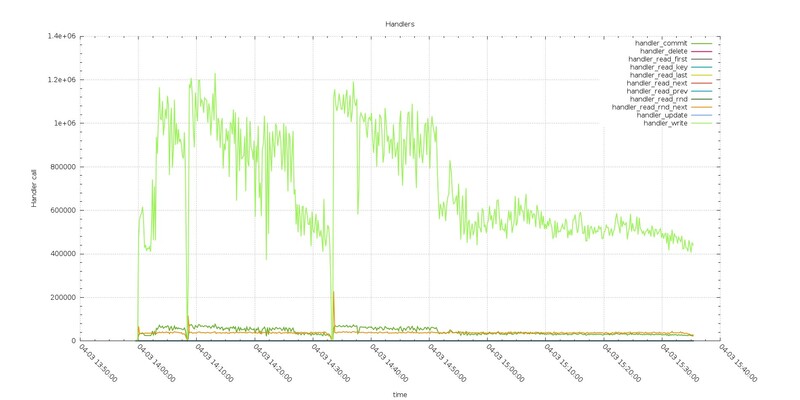 As we can see, in the presence of a hot spot the solution using Percona XtraDB Cluster outperformed Aurora, in both cases. 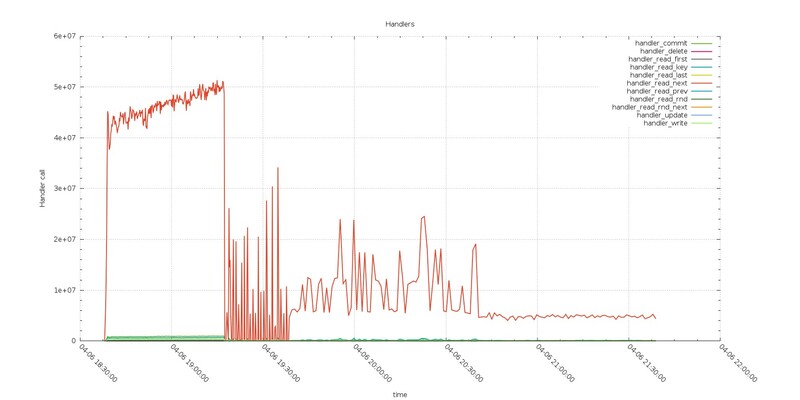 What is notable, though, is that while XtraDB Cluster remained approximately around the same time/performance, Aurora is significantly reduced the time taken. 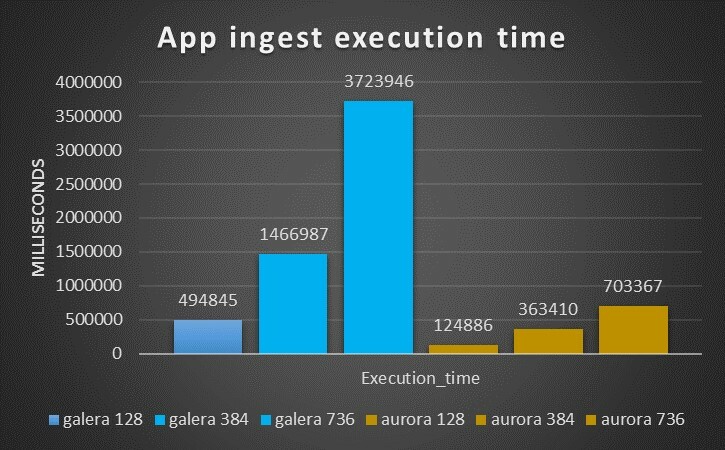 This shows that Aurora was taking advantage of the more powerful platform, while XtraDB Cluster was not able to. With further analyzation of the details, we notice that Aurora performs better atomically. It was able to manage more writes/second as well as rows and pages managed. But it was inconsistent: Aurora had performance hiccups at regular intervals. As such the final result was that it took more time to process the whole workload. I was not able to dig to deeply, given some metrics are not fully available in Aurora. As such I had to rely fully on Aurora engineers, who mentioned to me that hot-spot contention was a possible issue. 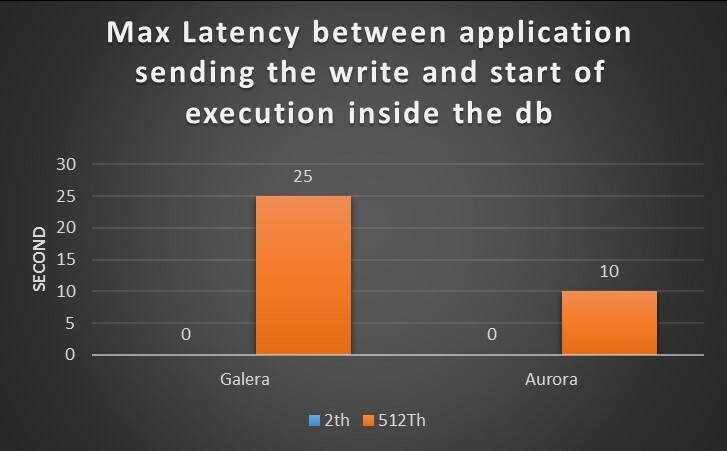 The execution in XtraDB Cluster showed fewer calls but constant performance, while Aurora has hiccups. The trend shown by the handlers stayed consistent in the page management and rows insert, as expected. As mentioned, this test showed many threads from different application servers, inserted by a batch of 50 statements against multiple tables. With small ones, the situation was inverted. But here is where the interesting part starts. The results are also constant, and don’t decrease significantly like the inserts with XtraDB Cluster. The number of handler commits, however, are significantly less. Once more they stay the same with the load increase, without impacting performance. Reviewing all handler calls, we get our first surprise. 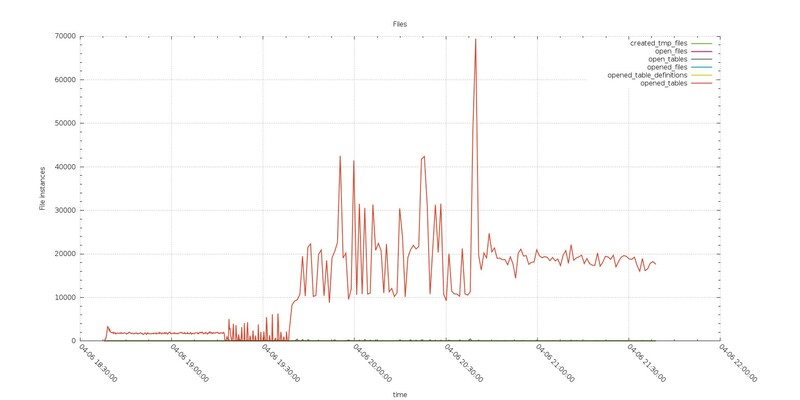 The gap/drop existing in the two graphs are the different tests (with an increasing number of threads). Two things to notice here: the first one is that XtraDB Cluster decreases in performance while processing the load, while Aurora does not. The second (you need to zoom the image) is the number of commits is floating in XtraDB Cluster, while it stays fixed in Aurora. An even bigger surprise comes up when reviewing the connections graphs. As expected, XtraDB Cluster has all my connections open, and the number of threads running is quite close to the number of connected threads. Both of them follow the increasing number of connected threads. But this is not the case in Aurora. Also, if my applications are trying to open ~800 threads, the Aurora node see only a part of them, and the number of running is fixed to 32 threads. The important things to consider here are that a) my applications don’t connect directly to the Aurora instance, but to a connector (MariaDB), and b) that Aurora, in this case, caps the number of running threads to the number of CPU available on the instance (here 32). Given that, I expected to have worse performance (but I don’t). The fact that Aurora uses one thread for multiple connections seems to be working quite efficiently. The number of rows inserted is also consistent with the handler calls, and has better performance than XtraDB Cluster. Again we have the same trend, only, this time, Aurora performs better than XtraDB Cluster. When run on the small boxes, this test saw XtraDB Cluster performing much better than Aurora. 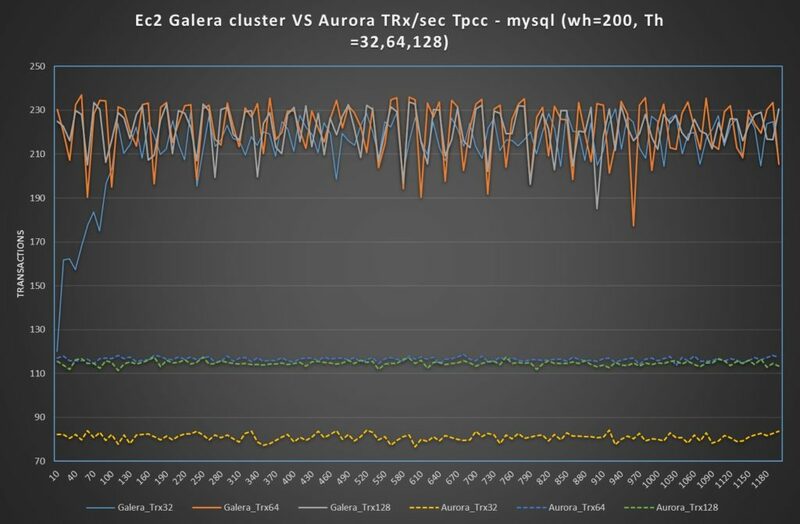 The time taken by Aurora was ~3 times the time taken by XtraDB Cluster. With a large box, I had the inverse result: Aurora is outperforming XtraDB Cluster from 2 to 7 times the speed. Analyzing the number of commands executed with the increasing workload, we can see how XtraDB Cluster can perform better than Aurora with a workload of 128 threads, but starts to have worse performance as the load increases. 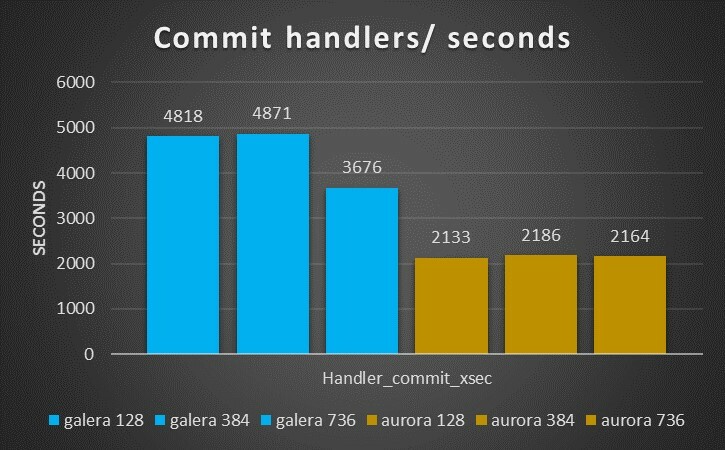 On the other hand, Aurora manages the read/write load without significant performance loss, which includes being able to increase the number of commits/sec. Reviewing the handler calls, we see that the handler commit calls are significantly less in Aurora (as already noticed in the ingest tests). Another thing to note is that the number of calls for XtraDB Cluster is significantly higher and not scaling, while Aurora has a nice scaling trend. The TPCC test is mainly to test OLTP traffic, with the note that some tables (like district) might become a hotspot. The tests I ran were executed against 400 warehouses, and used 128 threads maximum for the small box and 2048 threads for the large box. During this test, I hit one of the Aurora limitations and I escalated it to the Aurora engineers (who are aware of the problem). In the case of small boxes, there is nothing to say: XtraDB Cluster manages the load more efficiently. This trend is not optimal, having significant fluctuation. Aurora is just not able to keep it up. It is a different and a more complex scenario in the case of the use of large boxes. I would like to say that Aurora performs better. This is true for two of the three tests, and up to when it got stuck by internal limitation Aurora was also performing better on the third. But then its performance just collapsed. With a more in-depth investigation, I noticed that under the hood Aurora was not performing as well as it appeared. 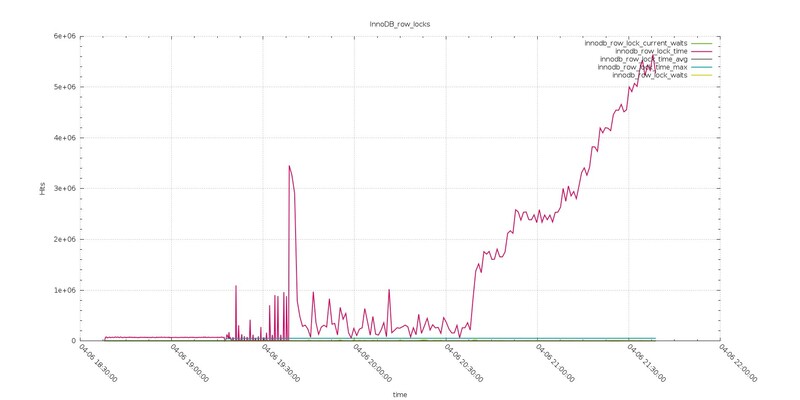 This comes out quite clearly by looking at a comparison between the graphs covering Comm_ execution, open files, handlers and InnoDBrow lock time. In all of them it is evident how XtraDB Cluster keeps serving the workload with consistent behavior, while Aurora fails the second test on (512 threads) — not just on the third with 2048 threads. 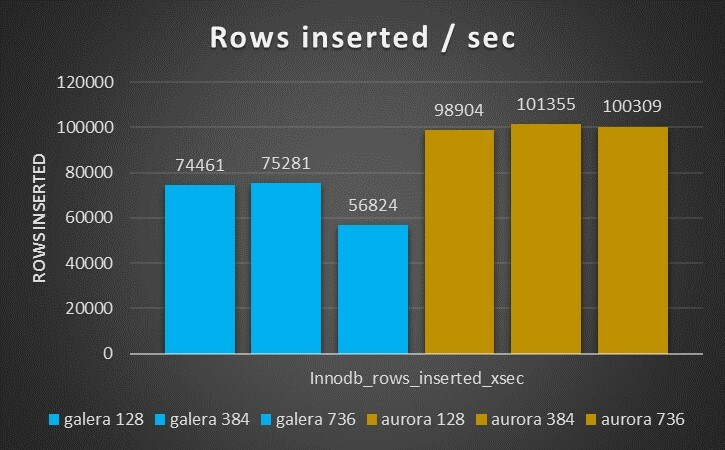 It is clear that Aurora was better served during the test with 256 threads going over the 450K com select serve (in 10 sec interval), compared with XtraDB Cluster that was not able to go over 350K. 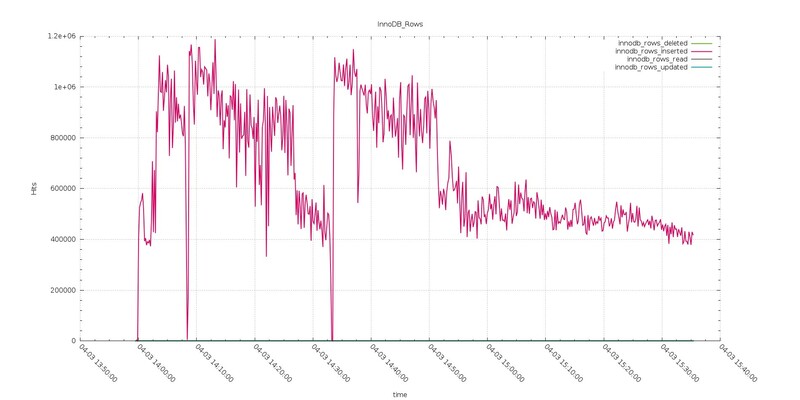 But in the following tests, while XtraDB Cluster was able to keep going (with decreasing performance), Aurora started to struggle with very inconsistent behavior. This was also confirmed by the open files graph. I was quite surprised by the number of files open by Aurora. Handlers reflected the same behavior, as well. Perfectly in line with the com trend. So what was increasing in reverse? As you can see from the above, the exactly same workload generated an increasing lock row time, from quite low in the test with 256 threads, up to a crazy high with 2048 threads. 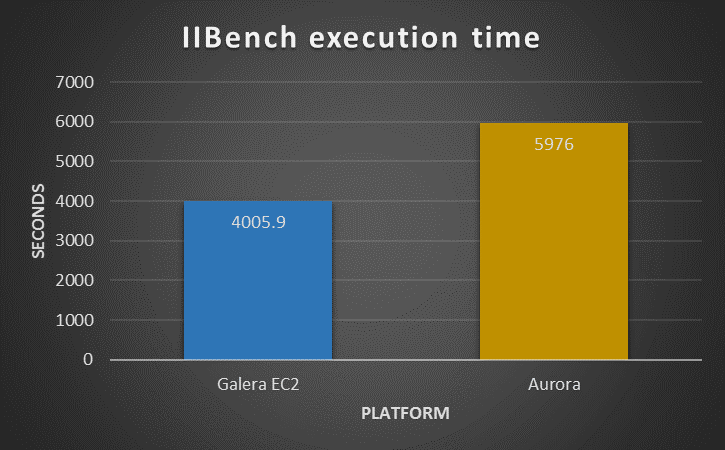 As mentioned, we know that TPCC has a couple of tables that act as hotspots, and we already saw with IIbench how Aurora is not working efficiently in that case. I also was getting a lot of 188 errors during the test. This is an Aurora internal error. When I reported it, I was told they know about it, and they are planning to work on it. I hope they do soon, because if this issue is solved it is very likely that Aurora will not only be able to manage the tested workload, but exceed it by far. 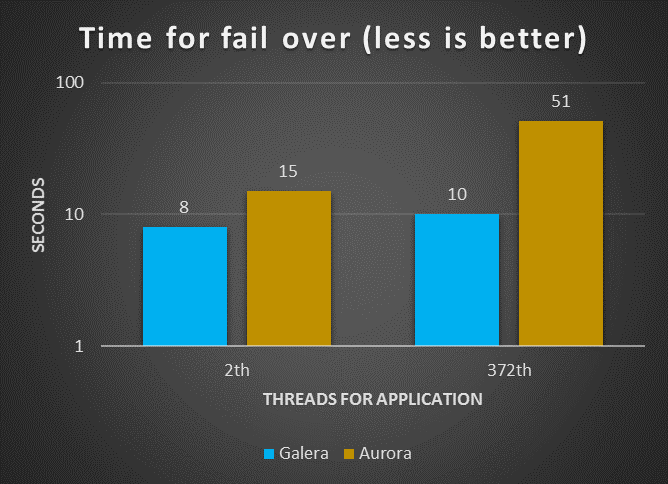 I am saying this because also with the identified issues Aurora was able to keep going and manage a more than decent response time during the second test (with 512 threads). 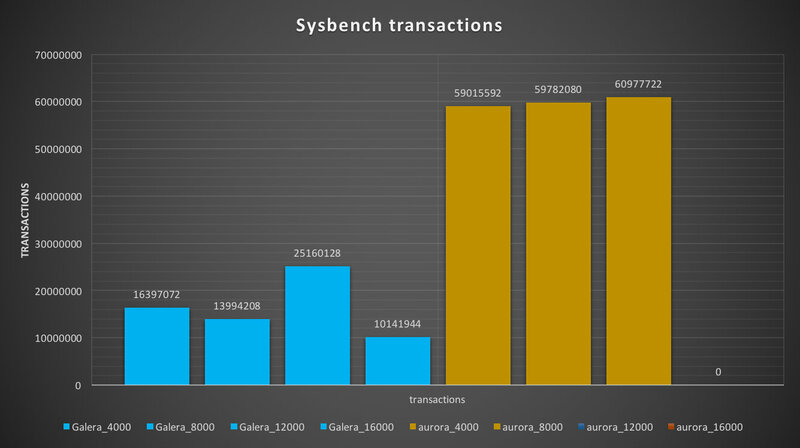 I added the sysbench tests to test scalability, and to see the what happens when the system reaches a saturation point. This test brought up some limitations existing in the Aurora solution, related more to the connector than the Aurora engine itself. Aurora has a limit of 16k connections. I wanted to see what happens if I got to saturation point or close to it. It doesn’t matter if this is a ridiculously high number or not. What happened was that Aurora managed traffic up to 4K. The closer I got to the limit, however, the more I had a connectivity issue. 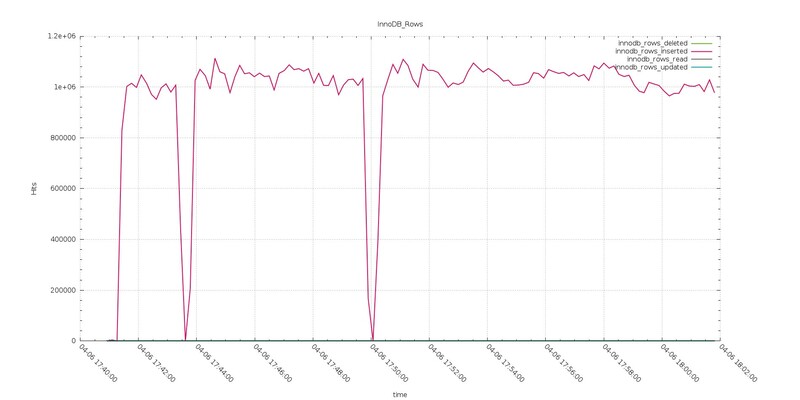 At the end I had to run the test with 8K, 12K and 20K threads pointing directly to the Aurora instance, bypassing the connector that was not able to serve the traffic. After that, I was able to hit up to ~15500 threads (but with a lot of inconsistent performance). I am defining the limit of a meaningful test from the previous level of 12K threads. XtraDB Cluster was able to scale up to 16K no problem. What also is notable here is that Aurora was able to manage the workload more efficiently regarding transaction handling (i.e., as transactions executed and latency). 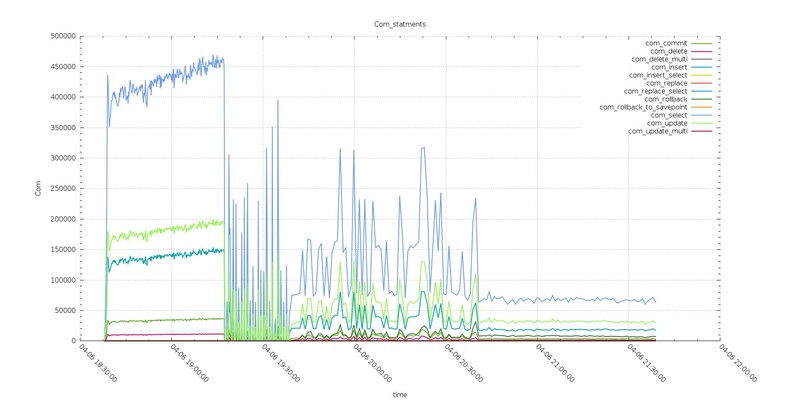 The number of transactions executed by Aurora was ~three times the one executed by XtraDB Cluster. 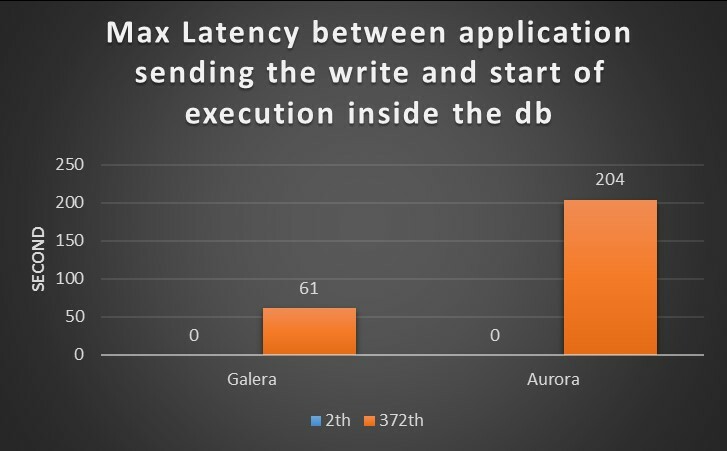 Regarding latency, Aurora showed less latency then XtraDB Cluster. 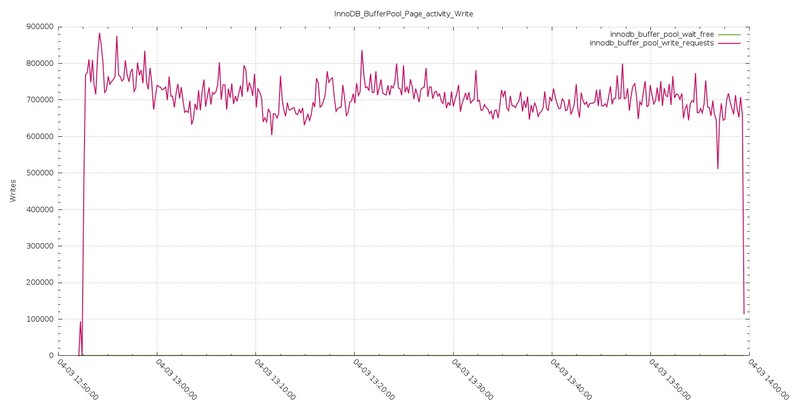 Commit calls in Aurora were a fraction of the calls in XtraDB Cluster, while the number of rollbacks was higher. The read calls had an even more divergent behavior, with XtraDB Cluster performing a higher number of read_keys, while Aurora was having a very limited number of them. Read_rnd are very high in XtraDB Cluster, but totally absent in Aurora (note that in Aurora, read_rnds are reported but seem not to increase). On the other hand, Aurora reported a high number of read_rnd_next, while XtraDB Cluster has none. 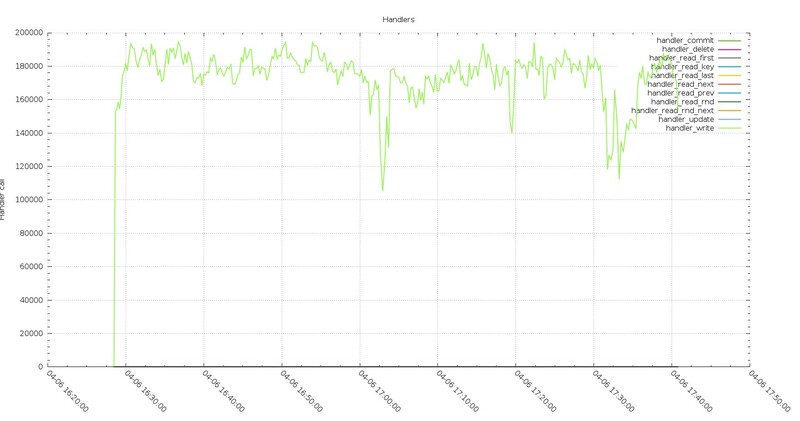 In this test, the fail-over time for the solution using Galera and HAProxy was more efficient. For both a limited or mid-level load. 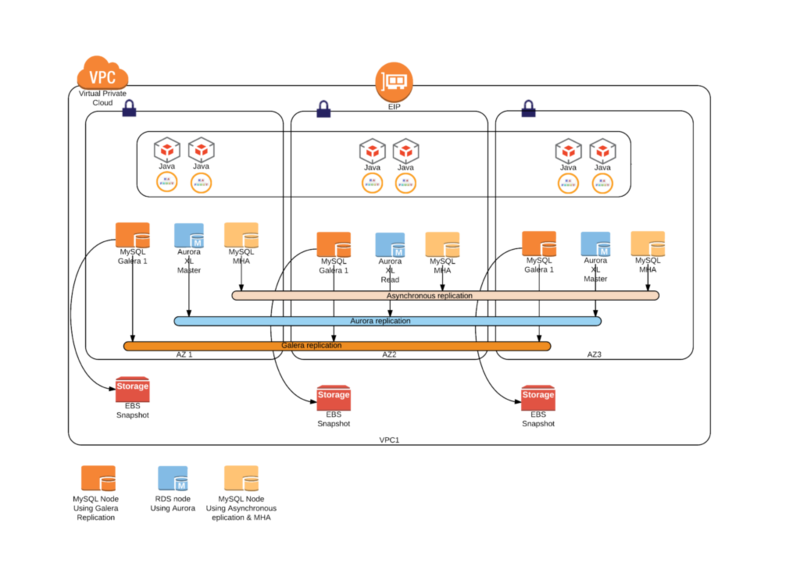 One assumption is that given Aurora has to verify both the status of the data transmitted and its consistency across the six data store nodes in every case; the process is not as fast as it could be. It could also be that the cluster connector is not as efficient as it should in redirecting the traffic from one node to another. It would be a very interesting exercise to replace it with some other custom solution. 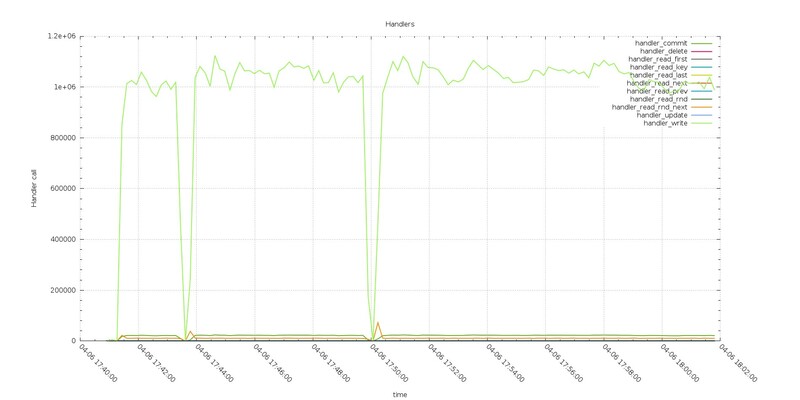 It is worth mentioning that of the eight seconds taken by MySQL/Galera to perform the failover, six were due to the HAProxy settings (which had a 3000 ms interval and two loops in the settings before executing failover). 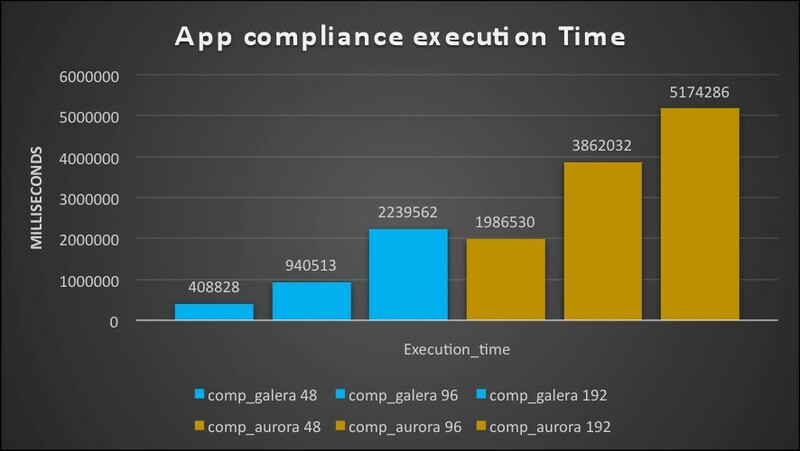 The purpose of these tests was to identify the latency existing between the moment that application sends the request and the moment MySQL/Aurora took the request in “charge”. 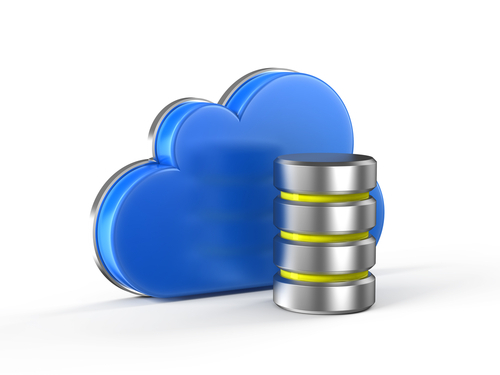 The expectation is that the busier the database, the higher the latency. For this test, I reported both results: the one coming from the old tests with the small box, and the new one with the large box. It is clear from the graphs that the two tests report different scenarios. 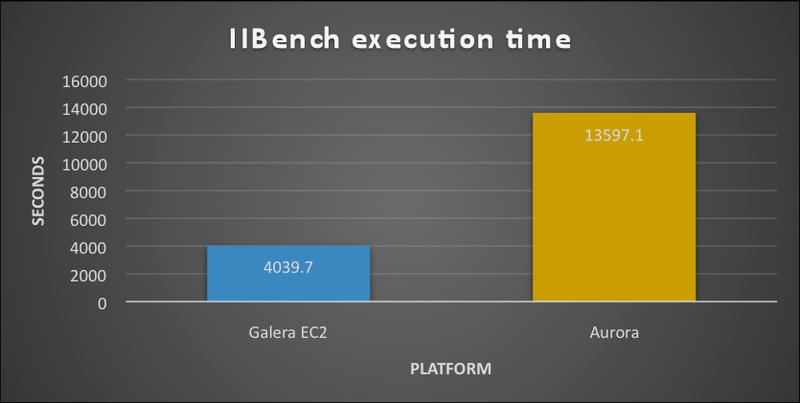 In the first, Galera was able to manage the load more efficiently and serve requests with lower latency. For the new tests, I had used a higher number of threads than the ones for the small box. Nevertheless, in the second test the CPU utilization and the number of running threads lead me to think that Aurora was finally able to utilize resources more efficiently and the lower latency. 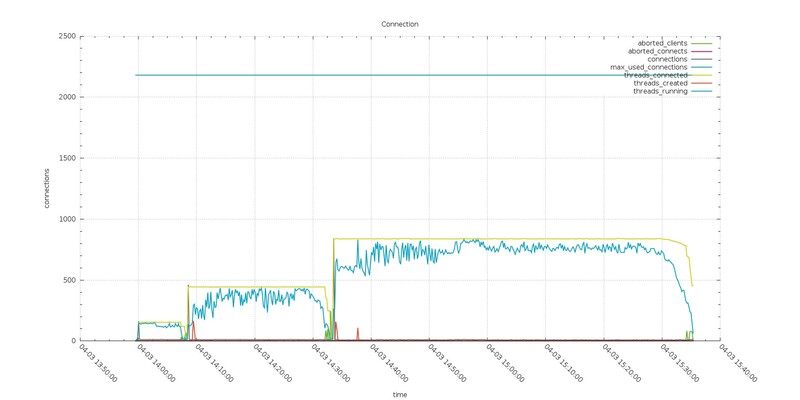 The latency jumped up again when the number of connections rose above 12K, but that was expected given previous tests results. 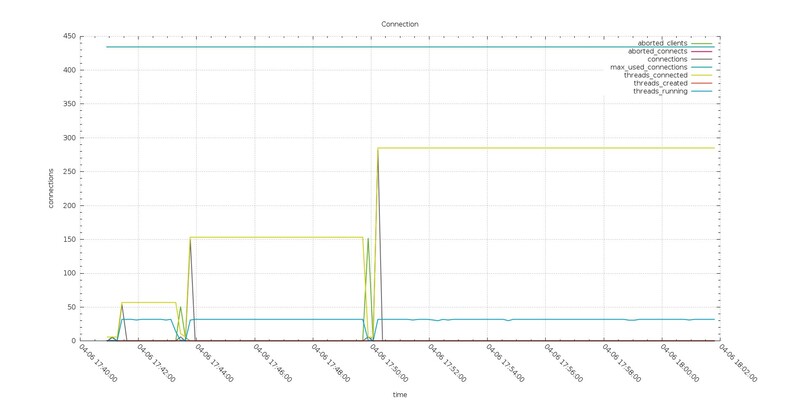 The two platforms were able to manage the failover operation in a limited time frame (below 1 minute). 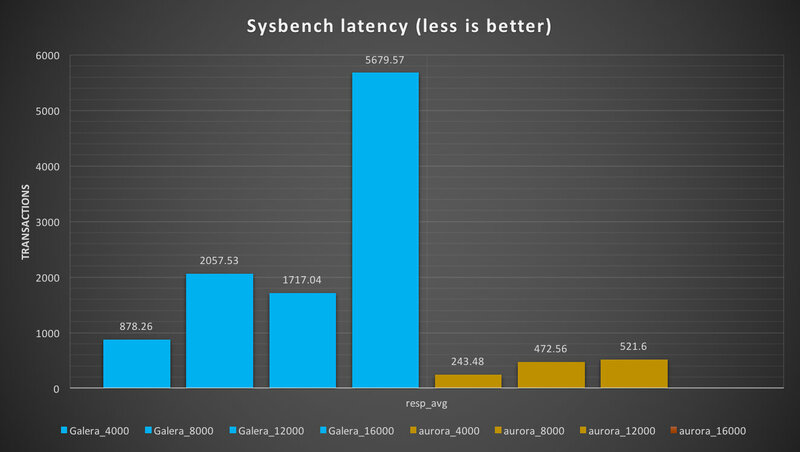 Nevertheless, MySQL/Galera was shown to be more efficient and consistent. This result is a direct consequence of synchronous replication, which by design prevents MySQL/Galera from allowing an active node to fall behind. In my opinion, the replication method used in Aurora is efficient, and given that data is shared across the read replicas, fail-over should happen faster. The tests suffered because of the connector, and I have the feeling that having another solution in place may bring some surprises (actually, I would like to test that as well). In this run of tests, Aurora was able to invert the results I had in the first test with the small boxes. 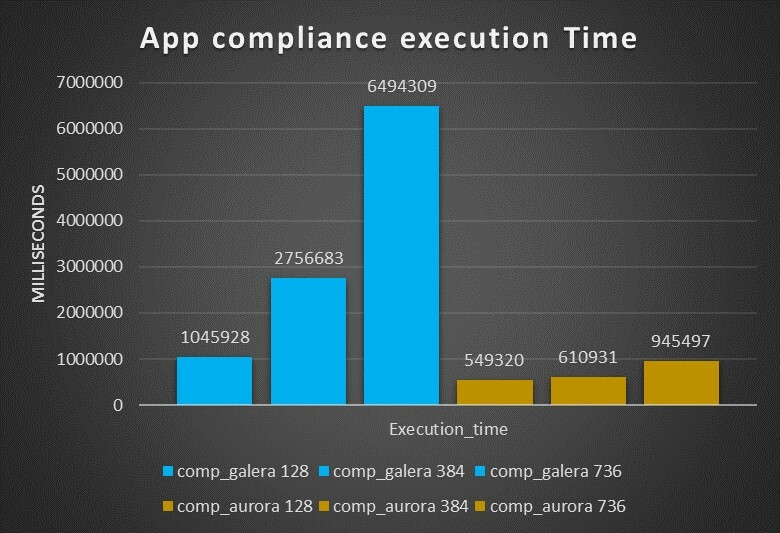 In almost all cases, Aurora performed as well or better then XtraDB Cluster. There are still cases where Aurora is penalized, and those are the ones where hotspots are present. The contention in Aurora is killing performance, and raise errors (188). But I hope we will see a significant evolution soon. The product is evolving quickly, and benchmark results may become obsolete in very short time (this is why it is important to have repeatable and comparable tests). From my point of view, in this set of tests Aurora clearly shows where it’s a better fit: higher-end levels, where high availability and CPU power is the focus (not concerns about the cost). There is no reason to use Aurora in small-mid boxes: the platform is not going to be as efficient as a standard solution like XtraDB Cluster. But if cost is not an issue, and the applications require a lot of parallelism, Aurora on db.r3.8xlarge is a good solution. I still see space for improvements (like for cluster connectors, or the time taken to restart a cluster after a full stop, or contention reduction). But I am also confident that the work led by the development team will fix most of my concerns (and more) soon. Final note: it would be nice to have the code open source, so that the community could contribute (but I understand the business reasons not to). I don’t think it is this the right place to mention the cost of each solution (especially because each need is different).